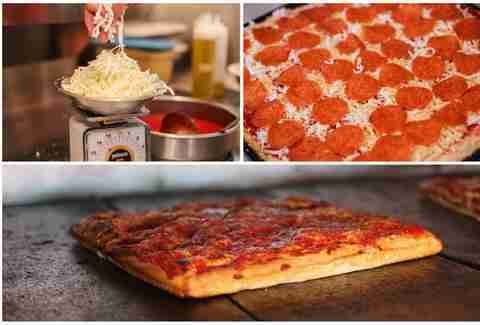 Everyone knows to avoid a Sicilian when death is on the line, unless, of course, you're at Home Slice and about to dive into their revered SoCo pie-master's new Monday special: a square Sicilian pie which you'll love so much, you'll want to marry it. 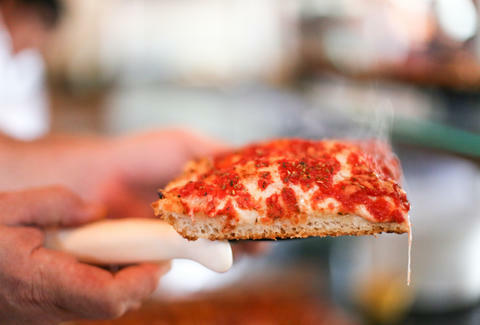 The recipe for the Sicilian's been in the works for over a year and a half, including a research trip to San Francisco, where the Homies ate 13 slices in a single day from iconic spots like Tony's. 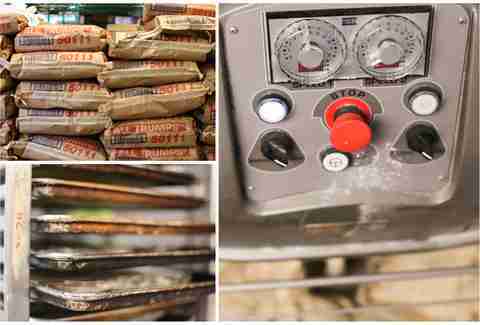 The dough's kneaded in this here machine on the right (don't press that red button! ), then doused in extra virgin olive oil and laid to rest for 24hrs in iron pans made in a WWII-era metal shop in the South Bronx. The 'za is delicately lathered in sauce so as not to crush the pillow-soft dough, then topped with 6oz of mozz, a sprinkling of Pecorino Romano, and, if it's lucky, a thick layer of pepperoni. Next, it's slid into the hottest part of the oven (the center back corners!) for 13min in the pan, then removed from the pan and sent back into the oven in order to get the perfect char on the bottom crust. That's what it looks like when it's fresh out of the oven and way too hot to eat without burning the roof of your mouth even though it'd be totally worth it. As they've come to perfect the technique, production has risen to roughly 70 of these bad boys every Monday, and they're available as whole pies or slices. That may seem like a ton of pizza, but it's a mere fraction of Home Slice's amazingly huge daily average of 700 full pizzas. 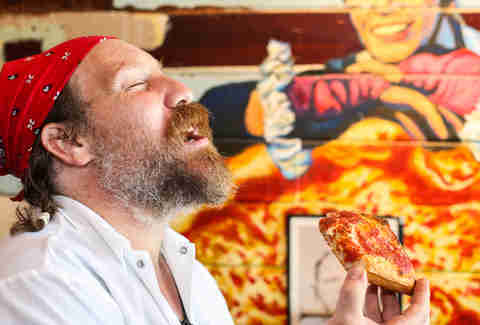 Here's one of the architects of this majestic pizza, Phil. 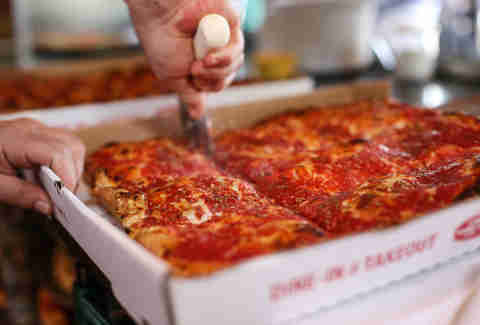 If you told him there's a better Sicilian slice in town, his answer would surely be "INCONCEIVABLE!"